Highly versatile, a Flexboat can be used for family recreation, diving, fishing, search and rescue, commercial activities, tourism, military, law enforcement. A Flexboat does not sink even if all tubes are deflated. There are several independent air chambers, and the boat has positive flotation even when tubes are punctured. Nearly three decades of market experience, a full line of inflatable boats and RIBs, more than 20,000 units manufactured and units exported to more than 13 countries worldwide. The hydrodynamics of a Flexboat lets the boat run smoother and achieve higher speeds with lower fuel consumption. Flexboat is the #1 provider for the military forces in Brazil. Federal Police, Navy, Fire Department, Environmental Police are among its clients. The hulls are built with isophthalic resin with UV protection while the tubes are built with Hypalon, Neoprene and Polyester based French "Orca" fabric which is extremely resistant to the elements and to chemical agents. Inflatable boats are a synonymous of safety. Inflatables do not sink not only because their tubes are built with several independent air chambers but because they have the fiberglass hull with its positive buoyancy as well.This is one of the main characteristics of inflatable boats compared to other types of boats. Safety for you and your family. Other characteristics of inflatables compared to other types of boats of the same size are that inflatables are light, versatile and dynamic. Stability, safety and high cargo capacity are other of their strengths. The advantage of being lighter than other boats is that you can use smaller engines to achieve the same performance. This will reduce your fuel costs and the cost of purchasing and maintaining the engine. This will also make it easier for you to trailer your boat and to launch it on a ramp. The lighter and smaller, the shallower the water it can navigate on. Inflatables can reach places that are prohibited to other vessels the same size. Stability: Inflatables are the most stable boats in the water due to their tubes which provide high levels of positive buoyancy and a low center of gravity. Therefore, inflatable boats are virtually impossible to capsize, one of the essential qualities for safe navigation. Inflatable boats lean less when making turns that fiberglass boats. They do not lean more than 20 degrees in general. This gives passengers an added feeling of safety and comfort. Boarding and exiting the boat is easier on an inflatable due to its low free board which allows for easy access not only on the sides but on the bow as well. All the advantages above make inflatables a better and safer boat in any sea condition. Flexboat is always looking for constant improvement of its products. We continually invest in our staff by training them and we are always developing new products aimed at the satisfaction and safety of our customers. Flexboats new product development department is equipped with a plotter for the construction of its molds. This ensures symmetry, adequate weight distribution and great performance in the water. The fiberglass hulls have flanges for perfect matching of the tubes and the lamination plan is meticulously crafted for satisfactory performance and guaranteed durability. All models have their tubes perfectly fitting the "V" hull ensuring lower vibration and less drag with the water. Electric harnesses, steering cables and control cables run inside the hull in previously installed ducts. Doors, hatches and covers are finished on both sides. Seats and backrests are manufactured using the German seamless Hinterschaum process (Flexboat exclusivity in the marine world). They are totally waterproof and do not get soaked on a rainy day or even when passengers sit in wet swimwear. Highly versatile, a Flexboat can be used for family recreation, support for larger vessels, diving, fishing, search and rescue, commercial activities, tourism, military, law enforcement. Flexboat inflatables have features that make them unbeatable in terms of safety: they do not sink even if all tubes are deflated. Flexboat designed all its vessels with several independent air chambers on the tubes. 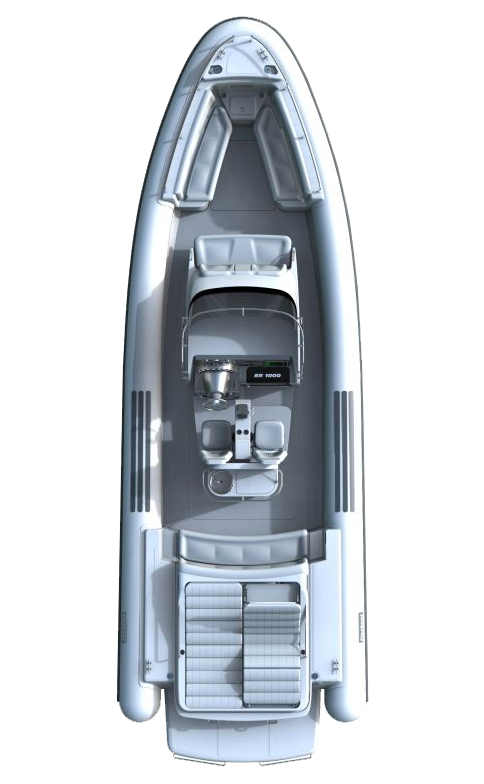 The number of chambers varies with the size and model of the boat. This ensures that in the event of a major accident where the tubes lose air, you will not lose the boat's navigability. Even if all air chambers are punctured, the fiberglass structure has positive flotation and the boat stays afloat. All Flexboat boats have positive flotation even in the event of failure of the hull or tubes. Its V hull allows it to face any type of sea and at the same time lets you get closer to the beach due to its shallow draft. 1 - Improved visibility to the captain due to the smaller tube diameter at the bow. 2 - Better hydrodynamics because the smaller diameter tube at the bow allows the boat to have a sharper entry in the fiberglass hull, improving its capability to cut the waves. 3 - When hitting a wave the aft part of the cone shaped tubes touch the water thus absorbing part of the impact on the passengers and making navigation smoother. 4 - The conical tube also increases useful cockpit space. 5 - Better aerodynamics, because the smaller tube diameter in the bow represents a smaller obstacle to the wind. The advantages above increase speed, reduces fuel consumption, provides smoother navigation, and makes the Flexboat inflatable boat more good looking. The life expectancy of a Flexboat inflatable exceeds 15 years. This is due in most part to the high quality of the raw materials used in its construction. In the manufacture of our products we only use raw materials with assured quality, acquired from renowned suppliers in the nautical sector. The hulls are manufactured with isophthalic resin with anti UV protection and the tubes are built with French "Orca" Hypalon, Neoprene and Polyester fabric which is extremely resistant to the elements and to chemical agents. The tubes are vulcanized which guarantees perfect sealing and an excellent attachment to the hull, besides making it easy to repair. The boats can be kept inflated and if they lose some pressure the pump can be used on cold days. Why do Flexboat inflatables have such a high quality? All Flexboat boats go through several tests before they are delivered to the customers. Many of those tests were developed in conjunction with the Navy Department of Engineering. All boats are inflated to the normal working pressure of 3.41 psi (0.235 BAR) and checked after 24 hours. After this period the pressure must be between 3.069 psi and 3.751 psi. A foamy solution is applied to the tubes and air valves. No bubbles should occur. The rings suffer a 224.35 kgf (2.2 kN) traction for 10 minutes and there can be no deformation on the ring, or cracks in the fiberglass or gelcoat. A 101.97 kgf (1.1 kN) traction is applied for 10 minutes and there can be no damages neither on the life line nor on the tube. A 101.97 kgf (1.1 kN) traction is applied for 10 minutes and there can be no deformation on the handles, or cracks in the fiberglass or gel coat. The vessel is loaded with its maximum cargo capacity including passengers, equipment and accessories, and it must navigate with 2 deflated air chambers. Under those conditions the boat must keep a positive free board all over its perimeter, its shape and its stability. The boat is loaded with its maximum cargo capacity and all passengers sit in one side of the vessel. Under this condition the free board must be at least 30% of the original one. What are the differences between Hypalon and PVC? There are two types of inflatables on the market. Those built in Hypalon and those built in PVC. Hypalon is an elastomer (a kind of rubber) resistant to abrasion, sun rays, chemical agents and the action of time. It is composed of a nylon textile that makes the fabric extremely resistant to ruptures and guarantees dimensional stability (the inflatable boat does not change its shape over time). Calendering - It is a continuous process that consists of feeding the polymer (melted, softened and homogenized) in the heated cylinders of a calender. This ensures a uniform thickness. Spreading - Process by which the elastomer is deposited on a certain substrate, impregnating it. The raw material is poured on a mat where, with the aid of a squeegee, the elastomer is spread over the nylon textile. There is no guarantee of uniform thickness and therefore it is not considered a good quality product. PVC is a plastomer with limited abrasion resistance, and no resistance to sunlight and chemical agents. Its color fades over time, just like that of any plastic. Worse than that is that plastomers are originally stiff (hard as a ballpoint pen). To make them flexible, oil is added to the product. Another important detail is that plastomers are porous. When the industry adds oil into the composition of the product it covers the pores of the fabric eliminating leaks for some period of time; but with the action of ultraviolet rays the oil migrates out of the fabric leaving the pores free for air passage. It is still important to mention that when plastomers are hot welded (radiofrequency or electronic welding) it becomes impossible to open the inflatable's tube to make repairs. At the end of a repair, when the machine has to be removed from inside the tube, it is necessary to glue the final seam with regular adhesive to complete the operation. It is worth mentioning that rather than pointing out defects of either product we are simply talking about their features. What are the delivery terms of a Flexboat inflatable? Flexboat has an extensive product line and for this reason the delivery time varies. Our Flexboat USA warehouse has boats in inventory and we also accept orders for new boats to be built and brought from Brazil directly to the customer if needed. Please contact us through our website or by any other communication channel if you have any questions. Flexboat is totally online! You can learn about our RIBs here in our website and also keep updated about Flexboat events and promotions on our social media platforms such as Facebook, Instagram, Twitter, Pinterest and Google+. Watch incredible videos about our boats, interviews, boat shows and much more in our video channels at Youtube and Vimeo. Just look for ‘Flexboat International’ and keep in touch with us.